Few people would think of reconfiguring the design of the traditional bicycle, a product whose simplicity and efficiency seem to have reached its pinnacle and did not require any changes. Tyler Hadzicki did not agree. He believed there was room for improvement. So, when he was 14-years-old, he decided to reinvent the bicycle wheel, by developing a science fair idea that would make the bike better. Creating the new machine started with a few basic components needed to make a vehicle, a seat, pedals, handlebars and wheels, a minimalist design approach and many blank sheets of paper, resulting in seven designs and at least two prototypes. In 2013, 17-year-old Tyler finalized his invention, which he named the Onda Cycle, since onda means wave in Spanish and the bike moves somewhat like a wave. The Onda Cycle is a fusion between the bike and a Big Wheel, with riders being closer to the ground and having the ability to spin backward and forward. While the front wheel can be steered like a regular bike, the rear wheel can be steered by the rider to make precise spins, turns and drifts. The Onda also has a wheel lock feature allowing the rear wheel to be locked in a forward facing position to prevent spinning out at high speeds. The teenager first presented his idea in his school’s science fair. He subsequently obtained two patents for his invention. 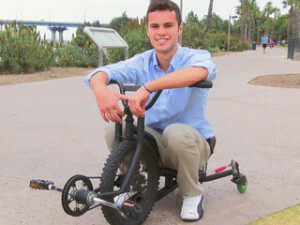 Wanting to bring the product to the market, he decided to start a Kickstarter campaign to raise mass production funds. In less than a month, he raised $46,000, three-times more than what he was requesting to produce black, white, red and blue models of the Onda cycle. The product had over 140 backers offering financial support for the initiative. Tyler was surprised and humbled by the incredible positive response that he got in response to his Kickstarter campaign. In developing the bike, Tyler was helped by his father, an engineer and inventor who started his own company, Revolution Enterprises, which produces a wide variety of products over 20 years ago and, thus, has significant experience in inventing. His father’s creativity inspired the teenager to try developing his own product, while his experience ensured that the production, quality control and shipping were properly taken care of. While the Onda Bike may look reckless, it is, in fact, safer than a regular bike, because three wheels are more stable than two, making it harder to fall. Even when falling, the impact would be very small, since the biker is only 5 inches off the ground. The Onda can also be adjusted for different rider heights from 4.5 ot 6.4 ft. and has been tested for over a thousand hours on the road to ensure its safety. As for speed, the cycle reaches 15mph with relaxed pedaling and little effort, but can go up to 21 mph.